Julie Christie started out as a newspaper journalist, before moving into television in the late 80s. In 1991 she set up her own company, Touchdown Productions; fifteen years later she sold Touchdown to Dutch media group Eyeworks, lthough she stayed on as CEO of Eyeworks New Zealand until late 2012. After the documentary rated highly, Christie went and asked for a pay rise, but was turned down. So she went and formed Touchdown Productions; within a few years she had grown it into New Zealand's largest producer of entertainment TV, with a thriving business in exporting programme formats. Christie told Her magazine that she became "a lot more staunch" about retaining intellectual property rights after "three programmes I had created were taken from me to be produced in-house at TVNZ". She also took on the long-running This is Your Life, winning two New Zealand television awards in the process. By the time Eyeworks bought the company, Touchdown shows had been franchised to 29 countries. Breakthrough quiz show The Chair was one of its most successful exports. Many of Christie's programmes became staples of local television schedules — Changing Rooms, nine seasons plus of My House My Castle, Whose House Is It Anyway, export Treasure Island, DIY Rescue, Trading Places, and eleven years of Game of Two Halves. The company has also retooled overseas formats for local audiences, including time-travelling reality show Pioneer House, Captive and Dragons' Den, in which Christie was one of the those who decided which entrepreneurs to invest in. Touchdown's shows made stars out of a number of presenters, including Matthew Ridge and Marc Ellis (Fresh-up in the Deep End) and April Ieremia. Some shows failed to find success (eg The Player, starring Nicky Watson); others dared to turn reality television on its head (Living the Dream, in which all the contestants but one were actors). In 2001 Touchdown began to exploit its formats overseas. Its first American pitch — and sale — resulted in High Country Dance (which Christie directed, wrote and produced) screening on the Fox Network under the title Looking For Love: Bachelorettes in Alaska. "The US market is wonderfully open to ideas from outside," she has said. "They have a voracious appetite and unscripted television is a vital part of everyday life to them." Further international success followed with productions of Treasure Island for RTE Ireland and Australia's Channel 7. Then came 2002 quiz show The Chair, which Touchdown produced in two versions that year: a Kiwi version hosted by Matthew Ridge, and one for ABC in America, led by tennis legend John McEnroe. Although the American version lasted only one season, the format went on to sell to 29 countries including the BBC, VOX in Germany and TF1 in France. In later years Touchdown expanded cautiously into drama, with 2008 dead husband series Burying Brian, and feature films The Tattooist and The Hopes and Dreams of Gazza Snell. Christie has won two NZ Television Awards for Best Entertainment Programme, two Qantas Media Awards for Best Lifestyle series, and People's Choice Awards for Game of Two Halves and DIY Rescue. 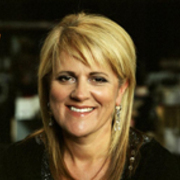 In 2012 she was annointed best director, for launching the Kiwi version of renovation show The Block. She was the recipient of the WIFT 2004 award for international television achievement, and chaired the Government's Screen Production Industry Taskforce. She was also the first Kiwi recipient of the prestigious global Veuve Clicquot Award, which celebrates female entrepreneurship. In 2007 Christie was made an Officer of the New Zealand Order of Merit, for Services to Television; she became a Dame Companion of the Order in 2017, for her contributions to television, and her time on the boards of both the 2011 Rugby World Cup board and the NZ Story Group, "which protects the intellectual property of the Silver Fern". Christie is on the board of directors at MediaWorks, owners of TV3. Her business interests include pay TV channels, Living and Food, investments in restaurants and bars, and a resort in Fiji.